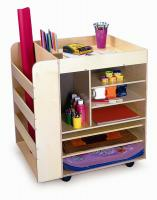 Art Supply Unit is a great solution for art projects and classroom clutter, just roll this art cart over to the next art project! Two sides have shelves and compartments for supplies and paper. The third side includes a deep bay for storing paper rolls. Large Shelves - 23" W x 23.7 deep, Medium shelves 15" W x 11.8" deep, small shelves 7.5" W x 11.8" deep, side pocket 23" W x 5" deep. Birch plywood construction and heavy-duty casters. Ships fully assembled. Ships by truck. Made in the USA. Greenguard Certified. Dimensions: 24in. × 30in. × 33in.